Everybody is familiar with Spanish tapas and pintxos from the Basque region at this stage. Italy isn't exactly renowned for its range of little bites to accompany an aperitivo, right? Wrong. Venice is the home of the cicchetti, a refined range of special snacks. Called spuntini, piccoli cibi and stuzzichine in other parts of Italy, these delicious little snacks are the perfect accompaniment to an early evening aperitivo or in larger quantities as a light lunch. Cicchetti: And Other Small Italian Dishes To Share is co-written by Lindy Wildsmith and Valentina Harris. Lindy has written several books about Italian food and loves all things Italian. Valentina Harris is an acknowledged expert on Italian food, having written over 30 books on the subject and has appeared on many television programmes sharing her food philosophy of using local seasonal produce to make dishes with maximum care and minimum fuss. 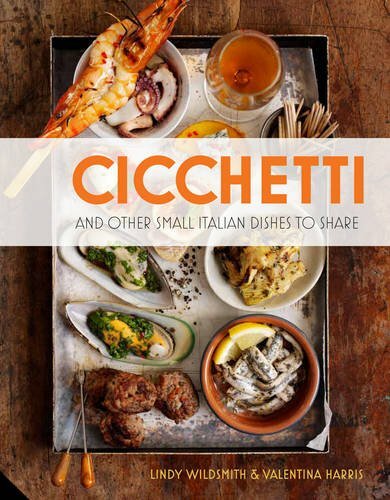 Cicchetti: And Other Small Italian Dishes To Share is published by The Aurum Publishing Group and is priced at £20.00.